BAGHDAD / GENEVA — The United Nations Assistance Mission for Iraq (UNAMI) issued today its fourteenth report on the human rights situation in the country covering the period from July to December 2008. The report, produced in cooperation with the Office of the United Nations High Commissioner for Human Rights, notes that although the period covered was characterised by further improvements in security, the overall human rights situation in Iraq remains a matter of concern. IRAQ: Death knell for agriculture? 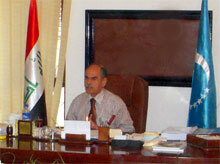 BAGHDAD, 28 April 2009 (IRIN) – Water shortages, high levels of salinity, and desertification appear to have badly affected agricultural production this last winter, according to officials from the Iraqi agriculture and water resources ministries.desertification. “Our concern is big and unprecedented,” al-Qaisi said. European Commission land management and natural hazards unit. agricrops to grow. “We are suffering from a real and serious water crisis,” Mahdi al-Qaisi, undersecretary in the Agriculture Ministry, told IRIN in Baghdad. “We are not expecting winter season crops to meet local demand, and summer crops will probably be affected as well,” al-Qaisi said. with focus on Arab and Islamic worlds and the non-Arab Middle East. For many centuries Kerkuk has been the Turkmens’ capital city and main cultural centre in Iraq, Turkmens are not an insignificant minority in the city as implied in Brian Murphy’s article. If Brian Murphy had done his homework he would know that Kurds are newcomers in Kerkuk. They were settled in Kerkuk by the Kurdish warlords Barzani and Talabani to change the demography of the city. The largest demographical change happened since 2003 when over 600.000 Kurds were brought to Kerkuk and surrounding Turkmen towns. The majority of these immigrant Kurds had not been evicted from the city by the Baath regime, they came from Iran, Syria and other parts of Northern Iraq. In April 2003 Kerkuk had 750.000 inhabitants, today it has over 1.35 million inhabitants, and all the newcomers are Kurds! Kurds pretend that Kerkuk is “historically Kurdish”!!! If that is the case, where are their monuments? Where are the historical traces of their presence in Kerkuk? Many monuments demonstrate the long history of the Turkmens in the north of Iraq, in his book “The Urban Fabric and Traditional Houses of KERKUK” (see details at the top of the page under “Books“) Dr. Suphi Saatçi documents the contributions made by Turkmens to the field of residential architecture. Since the invasion and occupation of Iraq by the US-led coalition Kurds have been trying to include oil rich Kerkuk into their Kurdistan region, they have imposed their hegemony over the entire north of Iraq by force, against the will of the Turkmens who are the second most important ethnic community in the north of Iraq. It should be noted that the other ethnic groups in the north of Iraq: the Arabs, the Assyrians, the Shabaks and the Yezidis, also oppose Kurdish hegemony. BAGHDAD – Iraq’s prime minister denounced a deadly U.S. raid on Sunday as a “crime” that violated the security pact with Washington and demanded American commanders hand over those responsible to face possible trial in Iraqi courts. 7- Türkmenlerin Siyasi Amacı Belirsizdir: Kimisine göre Musul bölgesi olarak Türkiyeye bağlanmak, kimisine göre Iraka bağlı, eşit ortaklıklı üçlü Kuzey (Musul) federasyonunda özerk Türkmeneli hükümetini kurmak, bir diğerine göre Bağdada bağlı özerk Türkmeneli devletini kurmak. Başkasına göre üniter Irak içinde yerel hükümete sahip olmak, başkasına göre üniter Irak içinde nüfus sayısına orantılı olarak yönetimden pay almak. Bir diğeri ise millet neye karar verirse o olsun diyor. Bazısı, Kürtler ne aldıysa onu istediklerini, hele hele bazılarının amacı ise sadece Kürt düşmalığıdır, hiç bir hak istemezler, sadece Kürt olmasın, yöneticileri ne olursa olsun diyorlar. Bu kadar karışık ve çapraşık amaçlar sonucunda, siyasi gündem de karışık ve çelişkili oluyor. Kimisi Şii Araplara bağlanıyor, diğerleri Sünni Araplarla işbirliği içinde, bir kısmı ise dışarıdan medet bekliyor, geri kalanı ise “hele dur bir bakalım ne olur” deyip beklentiye geçiyor. حضر الدكتور سعد الدين أركيج ، رئيس الجبهة التركمانية و عضو مجلس النواب، حفلا كبيرا عصر السبت بمناسبة الذكرى الرابعة عشرة لتأسيس الجبهة التركمانية العراقية. و حضر الحفل السيد عبد الرحمن مصطفى، محافظ كركوك، و السيد منير القافلي، رئيس مجلس قضاء كركوك، و اعضاء الكتلتين التركمانية في مجلسي محافظة و قضاء كركوك و اعضاء المكتب التفيذي للجبهة و مسؤولو فروعها في بغداد و مناطاق تركمن ايلي و مسؤولو مكاتبها في كركوك و منظمات المجتمع المدني التركمانية و الأحزاب التركمانية و ممثلون عن الأحزاب العربية و الكردية و الأشورية و قادة و ضباط الجيش و الشرطة و السيد فاتح تورك جان، رئيس الوقف التركماني و جمع غفير من الجماهير التركمانية من كركوك و مدن و بلدات تركمن ايلي. و في كلمته، اكد أركيج ان الجبهة تأسست في أربيل التركمانية و التي و للأسف لا يرفرف علم الجبهة الآن، و تساءل ” اية ديمقراطية هذه؟” و طالب من يحاول وضع يد على كركوك ان يرفعها، مؤكدا ” ان حل كركوك يتم بيد الكركوكليين الأصليين”، و حث التركمان على العمل الجاد استعدادا للاحصاء السكاني القادم و الانتخابات العامة، مضيفا ان الاحصاء السكاني مهم جدا لأنه سيكشف عن الثقل الحقيقي للتركمان. و اكد محافظ كركوك في كلمته بأن التركمان مكون رئيسي في العراق و انهم عانوا الظلم و الاضطهاد في السابق و ان كركوك مدينة التعايش بين جميع مكوناتها. يدّعي تشارلس دارون بانَّ الانسان تطوّرَ من خلية نباتيّة واحدة ومرَّ بمراحل عديدة قبل انْ يصبح انسانا، وفي سُلّم تطوّره مرَّ الانسان بجميع المراحل الحيوانيّة من الاسماك والزواحف والطيور واللبائن. تساؤل يخطر في الذهن، اذا كانت كل هذه الحيوانات اجدادنا فهل انّ كروموسوماتنا وجيناتنا تحمل بعض او جميع صفات تلك الحيوانات؟ اذا القينا نظرة متمعنة على طبائع البشر نلاحظ بانّه خليط من طبائع الحيوانات التي سبقناها في سلَّم التطور ، فالانسان يمتلك شجاعة الاسد وجُبن الارنب ومكر الثعلب وغباء الحمار وخاصيّة العمل الجماعي للنمل والنحل وتلون الحرباء كوسيلة للدفاع ( نلاحظ انَّ بعض الاشخاص في العراق كان شيوعيا ثمّ اصبح قوميا ومن ثمّ نراه متديّنا او طائفيّا ) وبدرجات متفاوتة. انّ الفرق بيننا وبين اجدادنا الحيوانات هو في درجة تطوّر عقولنا لانّ العقل الانساني وكما اراد الله سبحانه وتعالى لا يقف في تطوّره عند حد معيّن، فهو يرتقي يوما بعد يوم وجيلا بعد جيل الى ماشاء الله له. Below is Ahmet Yilmaz’s reaction to Corinne Reilly | McClatchy Newspapers’ article: “U.N. experts urge power sharing in Kerkuk” in which she writes that ‘Kerkuk is historically Kurdish’!!! First, I am deeply troubled by this statement that you make about Kurds having some historic entitlement to the city of Kirkuk. I am curious as to see where you are pulling your references from?! Second, the mere fact that the current diverse ethnic composition of Kerkuk should be a clear indication that perhaps the city may have not been inhabited exclusively by a single ethnic group in the past. For you to carelessly insert an overly-generalized statement does not only reveal your myopic understanding of the historical and present situation in Kerkuk, but also your apparent bias that clearly favors the Kurds. While I don’t care much about what your opinions are on the matter, I do think that it is dangerous for a journalist to be academically unprepared and misguided when it comes to taking on a such an important and controversial topic.